Sony Asked Ubisoft What They Wanted From PS4. Ubisoft Said Make It More Like PCs And Phones. Ubisoft CEO Yves Guillemot likes the PlayStation 4. Otherwise he wouldn't have showed up at Sony's big PlayStation 4 event last week, right? He likes the PS4 in part because it's, well, a little less like a console and a little more like some of those other machines you might play games on: the computer and the phone. It's more of a connected machine, letting you capture and share video, network with friends, access the device and maybe some of its games from other devices like phones and tablets, etc. Ubisoft are fans of this kind of thing. Look, Sony asked Ubisoft what they wanted for this new PlayStation: "Because we've been in the industry for a while, what happens generally—before creating the specs and creating the machine—the manufacturers come to us and say, 'What do you want on the next one?'" Guillemot told me right after Sony's show last week in New York City. "We want social, we want all the things that exist on PC to be possible on a console. We want the mobile capacities to play short-term and to play from anywhere you want." Note what he didn't say: better graphics. But that's important, too, Guillemot told me, when I noted the omission: "Actually you need both, because, in our world, the fact that you can be immersed in new worlds with NPCs who can be emotional will help you to get into those worlds and be immersed." "The other part that has been growing fast has been all the social—all the connections—the fact that you can update your content very quickly...all of those things [are things] we wanted them to bring in. We really pushed for them to make those things happen, because we think it's the two combined that will make this generation a good generation." Ubisoft has shown one PS4 game so far. 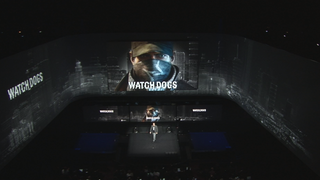 That's Watch Dogs, which is coming out this "holiday" season, same as Sony's console. It's also coming to current-gen [NOTE: "current-gen" in terms of performance; no insult intended, Wii U!] consoles: the PS3, the Xbox 360 and the Wii U. Guillemot suggests the game will be optimized for PS4. "What we do—and for Watch Dogs we do that as well—we go first on next-gen, taking all the capacities the machines can bring and then we try to push all this as much as we can into the consoles that are now the old generation. The first step is: what those [new] consoles can do, we have to do." Ubisoft isn't, say, Activision, which tends to take its time putting a lot of games out on a new platform. Ubisoft likes to put a pile of games on a new console. They did so for recent Nintendo launches like the 3DS and Wii U. They did so for the PlayStation Vita, releasing an original Assassin's Creed while most other publishers were looking at Sony's portable console like a frail tree that might not survive its first winter. I asked if Ubisoft would back the PS4 with the gusto it did this past November's Wii U. "It's in our DNA to be taking advantage of all the capacities the new consoles bring," he said, with the vagueness of a CEO whose comments can affect his company's stock price. "As there are plenty, as you could see tonight, we have lots of teams making sure they use those new functions and make the best games they can." So we've got Watch Dogs for PS4. And presumably some more stuff. How about that Beyond Good & Evil 2 game that fans have been waiting for and that the game's creator said would have to wait until the next-gen? "I don't give comments anymore on BG&E2," Guillemot said, "because I think ... the next time next time we communicate we have to have something new." Not specific to the PS4 or any other platform, he told me: "It's coming." Yep. I know some folks who are waiting.